Automatic recording of test scripts. Test scripts are easy to read and understand. Manual and semi-automatic test steps. Fast and tolerant image recognition. Search for images that are not visible on screen. Export and run tests in FitNesse. Read text from the screen using OCR. Script doctor that improves the image quality. Customization reports (Test Summary, Test History, Test Steps and Test Run). Command Editor view for powerful script editing. Create test suites or subroutines using Call commands. Store reusable images or steps in the Library. Change image folder to be able to handle several languages or screen resolutions. Copy script images to another folder. Copy script to another folder. Supports data driven test suites by running a script from a parameter (csv) file or a database query. Insert image captures or parameters into the script. Parameters to a script are automatically detected when inserting a Call command. Call scripts on remote machines. Extend the functionality using Java classes. File synchronization between clients and server. Use the Click command to click on something. The intelligent image recognition in JAutomate locates the best match on screen. The red oval indicates where inside the image to click. The WaitMouseMove command moves the mouse cursor to a new position. 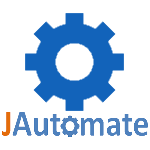 JAutomate will wait up to 30 seconds, by default, for the image to become visible on screen. The WaitVerify command can be used to verify a result. Click on an image in the script and use the Properties dialog to adjust the rectangle around the result to verify. Use the Write command to simulate keyboard input. Make sure to set the focus by clicking inside a field first. Use the Wait command to insert delays into the script. Waiting for a new page to load or a dialog to appear is a good practice. Call other scripts using the Call command. You may also pass parameters to a called script. Text can be used instead of an image in all commands. You need to specify the font so that JAutomate can convert the text into an image. The font can be automatically detected using the Detect Font from Image option. Use the Repeat command to iterate through a data file. This example calls another script for each line in the data file. Copy a result to use or verify. Get the copied value from the clipboard using the GetClip command and, for example, compare it against the expected value. The Read command reads a result using OCR. Only use the Read command when verifying or copying is not an option since OCR is not 100% reliable.